Jack Augur travels back in time thirty years to stop his own wedding. Although warned not to interfere with other events, within minutes of meeting his younger self, he inadvertently causes a motorcycle accident. He's now faced with the dire consequences of the death of the inventor of the time machine. The older and younger Jack Augur join forces to undo the damage they've done and get the world back on track, but mysterious forces thwart their every attempt. 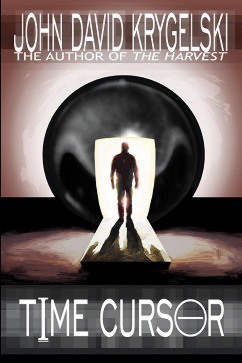 Time Cursor is a roller coaster ride of suspense, action, and intrigue with an ending that will not disappoint! "I just finished an amazing trip! The Time Cursor was such a great story. Your storytelling had me hooked from the moment I started reading the first page." "Just finished Time Cursor, and I loved it! So enjoyable to read a book that wasn't dumbed down." "I just finished time cursor. I usually only read Dean Koontz, Michael Connelly, or Stephen King, but while reading your book, I was easily forgetting it wasn't written by one of my childhood favorites. It was very well written and I enjoyed it completely. I generally figure out all aspects a book will contain and get bored quickly, but with yours, there were several unforeseen twists that I found awesome." "WOW! Great story - super plot. Really twisted my mind on the intricacies of time travel, or time segment repositioning if you prefer." "Time Cursor was amazing! What a great read from start to finish. I could hardly bear to put it down. I can't wait to read it again so I can pick up on all the little clues I missed the first time around. And, thank you! It's been too long since I have read a novel and not guessed nearly every element and twist of the plot from chapter one." "You kept me in your clutches until the very end!" "Time travel plots should veer off, loop around, and come back to some conclusion or explanation. Krygelski does this fantastically." "I just finished your book yesterday... I couldn't put it down! I really enjoyed it. Seriously... It was amazing!!! The ending freaked me out!!! I actually was sad when I finished it!!!"